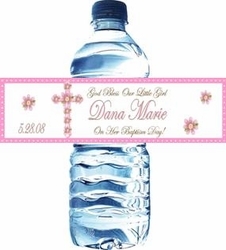 Personalized Christening and Baptism Water Bottles are perfect for the occasion! They make a great party favor and look fabulous on your tables or buffet table. Whether your having a Christening or a Baptism, the wording on our water bottle labels can be changed to either one. Choose from one of our traditional labels, or try a festive and fun water bottle label. Either way, our Christening and Baptism Water Bottle Labels will be a hit with your guests! Our water bottle labels are printed on a commercial laser printer. We use high quality glossy paper for a spectacular finish! Choose from waterproof water labels if your water bottle are being put on ice, or non waterproof water bottle labels if they are not being put on ice. If you have a design in mind and don't see it here, we will custom design you a label FREE! Just email us info@candyundercover.com or call us toll free at 877-235-2828 and we will be glad to assist you. We can add a photo to most any water bottle label FREE! Just email us your photo after you place your order. We will also email you a proof of your label for you to see, and make any changes that you like. All proofs are FREE! Our Water Bottle Labels measure 8" x 2" and fit most standard size water bottles. If you need a specific size, please let us know. Choose WATERPROOF Water Bottle Labels if your bottles are going on ice. Please allow 2 weeks when ordering. Rush orders are available. We will email you a proof of your label prior to printing.